Last week, we walked through the first steps to take after being involved in a car wreck. If you missed this Car Wreck 101 post, catch up here: CAR WRECK 101. Even when people follow these steps to the letter, we often see accident victims make one big mistake in the moments after the wreck: minimizing their injuries. They may say things like, “I’m fine!” or “It’s just a scratch.” Often, this is because they are relieved not to have sustained obviously catastrophic injuries, like broken bones or deep wounds. Adrenaline, which surges through the body as a response to a stressful situation, may also prevent someone from feeling pain in that moment. How will I know if I need medical attention after a wreck? 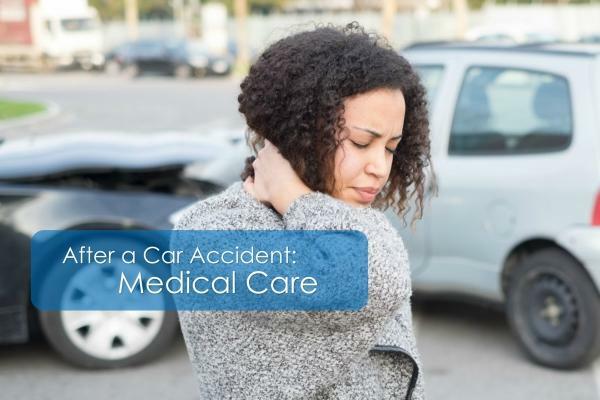 While we strongly recommend seeking medical care after a car accident, even one that seems minor, there is no law or set standard for how that should look. Should you call an ambulance? Go the Emergency Room? Make an appointment with your primary care physician (PCP) the next day? The first thing to evaluate is the level of pain you’re experiencing. Some injuries obviously warrant emergency care, including major bleeding, head trauma, and difficulty breathing. You should also consider going to an Emergency Room if you are experiencing head or neck pain, since upper neck and spine injuries can occur even in low-speed collisions and often have lasting consequences. What if I don’t experience pain at the scene of the accident, but it develops later? It’s important to remember that your decision about whether to seek emergency treatment at the accident scene doesn’t have to be final. If you go home and feel an onset of significant pain a few hours later, you can still go to the emergency room. Physicians there have experience with traumatic accidents, and they’ll be able to give you a realistic evaluation. Why should I consider seeing my family doctor if I didn’t go to the emergency room? If you decide that your injuries don’t warrant emergency treatment after the accident, it’s still important to set up an appointment with your Primary Care Physician. The longer you wait to see a doctor after a car wreck, the more difficult it will be to prove that your injuries were caused by the collision. You also put your own health at risk by neglecting to see medical help. If you choose to file a personal injury claim after the wreck, it’s vital to have documentation of a doctor’s evaluation, medical treatment, and medical bills. Do I have any other options for treatment after the accident? If a doctor determines that your injuries are “soft tissue” (that is, not broken bones or skin lacerations, but muscle and tissue strain), then you should consider treating with a local chiropractor. Chiropractors are medical professionals who treat soft tissue injuries. Your chiropractor will ask you about your injuries, perform an exam, and then work with you to create a treatment plan. Chiropractors often treat using “adjustments,” therapeutic manipulation using force applied in specific directions at specific points on your body. This will help regain mobility and relieve pain over time. Who can I call for guidance after my accident in Arkansas? Taylor King has been working to help Arkansas accident victims for more than two decades. The Taylor King Law firm represents thousands of Arkansans in car wreck cases each year. If you were injured in a car accident and have questions about the next steps to take with medical treatment or filing a personal injury claim, we can help. Contact us for a Free Consultation at 1-800-CAR WRECK (227-9732), or fill out our quick and easy Case Evaluation Form online. You can also download our free Taylor King Law app for iOS and Android. We’ll be happy to speak with you about your injuries and discuss your legal options. We’ll be on your side, by your side every step of the way.